Manual Meat Grinders are still used today and have not changed much from the old days. One Stop Jerky Shop sells a USA made Manual Meat Grinder. With our manual grinders you can process your game easily and quickly. #12 Manual Hand Grinder by Chop-Rite Two screws down to a table, board or other work surfaces. Hopper opening is 3 1/2" x 4 1/4". Comes standard with a 3/16" hardened steel Plate. Chop-Rite Two meat grinder is made of cast iron and coated with an FDA approved baked on non-stick coating which pr..
#22 Manual Hand Grinder by Chop-Rite Two screws down to a table, board or other work surfaces. Hopper opening is 4 1/4" x 5 1/4". Comes standard with a 3/16" hardened steel Plate. Chop-Rite Two meat grinder is made of cast iron and coated with an FDA approved baked on non-stick coating which provid..
#32 Manual Hand Grinder by Chop-Rite Two screws down to a table, board or other work surfaces. Hopper opening is 5 3/8" x 6 1/4". Comes standard with a 3/16" hardened steel Plate. 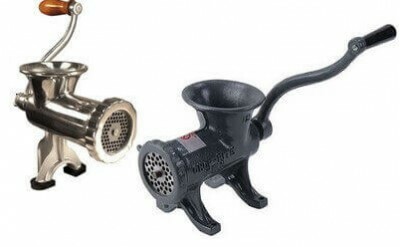 Chop-Rite Two meat grinder is made of cast iron and coated with an FDA approved baked on non-stick coating which provide..